As urban populations grow and the demand for local food rises, agricultural innovators see opportunity atop the roofs of city buildings. Much of this space is devoted to outdoor gardens, but rooftop greenhouses are also sprouting up in cities with cold climates. Some are large structures used for commercial purposes, some are owned by restaurants, some assist in feeding the needy, and some are used for educational purposes. But all have one thing in common—they enable growers to grow food year-round in urban settings. Gotham Greens, with two locations in Brooklyn and one in Queens, operates three of the numerous rooftop greenhouses that sit atop many of New York City’s buildings. Greenpoint, its flagship Brooklyn greenhouse, was constructed in 2010, contains more than 15,000 square feet and produces over 100 tons of greens every year. Its Gowanus location, also in Brooklyn, consists of over 20,000 square feet atop a Whole Foods Market. Annually, it grows over 200 tons of greens and tomatoes. Its Queens facility, in the Jamaica section of the borough, will utilize more than 60,000 square feet and begin producing crops this year. “Our vision is a city of rooftop farms”, reads the slogan of Montreal-based Lufa Farms. 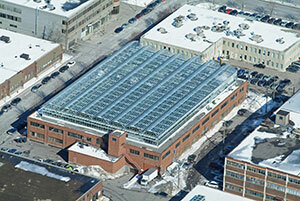 Its first of two rooftop greenhouses sits on top of a building in the center of Montreal and spans 30,000 square feet. Lufa farmers utilize sustainable hydroponics, despite the fact that this method is not organically-certified in Canada. This method poses less of an environmental impact. Produce at Lufa Farms is grown solely for taste and nutrition. A primary objective is to grow food where people already live―hence the city location. In Chicago, Dr. Pedro Albizu Campos High School sits in the city’s Humboldt Park neighborhood. On the roof of the school sits a hydroponic greenhouse, used both to grow food and educate its students about sustainability. Other greenhouses can be found on rooftops along the same road, Division Street. The high school builds its curriculum around social transformation, and views social ecology and urban agriculture as ways to transform the world. San Francisco nonprofit Project Open Hand provides healthy meals to the sick and elderly. The organization uses its greenhouse at its city headquarters to grow herbs and greens for use by its chefs in meals for clients. Basil, lettuce and micro-greens are grown inside the greenhouse, which utilizes hydroponic systems. On the rooftop of the Manhattan School for Children (Public School 333) in New York City sits a rooftop greenhouse. Its purpose? To educate students about where their food comes from, and to teach the link between food and health. The greenhouse is the result of a partnership of parents and New York Sun Works, a nonprofit organization that constructs science labs for city schools. Named the Sun Works Center for Environmental Studies, students experience the importance of sustainability. Key issues taught are climate change, the importance of green cities and the ability of agriculture to adapt to greater demand and changing circumstances. In Grand Rapids, Michigan, the Grand Rapids Downtown Market is all about local foods and sustainability. The market, with space for 24 vendors in its main hall and sustainability features such as a green roof and live walls, also has a rooftop greenhouse where some of the produce sold there is grown. A rooftop greenhouse is perched atop Exploratory Hall on the Fairfax, Va. campus of George Mason University. Part of the Department of Environmental Science and Policy, the greenhouse has three rooms simulating different climates. Other plants utilize an outdoor terrace. The greenhouse has partnered with the Smithsonian Museum of Natural History and the university’s Potomac Heights Vegetable Garden, which supplies area homeless shelters. The University of Chicago has a rooftop greenhouse on top of its Donnelley Biological Sciences Learning Center. It contains 7,500 square feet of growing space, and a portion of the greenhouse is used for drug research. Famed conservationist and forester Aldo Leopold taught at the University of Wisconsin-Madison. Now, a residence hall on campus bearing his name was built with sustainability in mind, and its many features include a 1,400-square foot rooftop greenhouse. Students who call the 52,800-square foot residence hall home enjoy the opportunity of growing and preparing their own food year-round (despite harsh Wisconsin winters). The residence hall is also home to the university’s Greenhouse Learning Community. New York City is home to many pizzerias, but Roberta’s Pizza in Brooklyn’s Bushwick neighborhood boasts its own rooftop greenhouses. The restaurant grows 20 percent of its produce in these two small facilities.